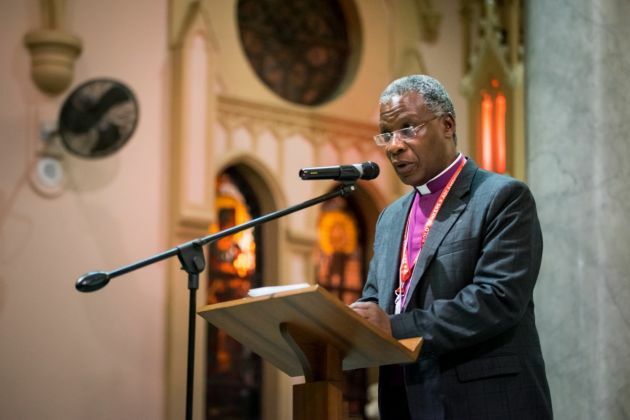 (Photo: Albin Hillert / WCC)Archbishop Thabo Makgoba has been outspoken from the pulpit. Makgoba, the Anglican archbishop of Cape Town, preaches during a July 19 interfaith prayer service, held at the Roman Catholic Emmanuel Cathedral in Durban, South Africa, during the 2016 International AIDS Conference. Archbishop Thabo Makgoba of Cape Town has appealed in his Easter sermon for South Africans to turn the crisis created by a "deeply corrupt regime" into an opportunity by creating a broad-based coalition to convene a national convention on land and the economy. The Southern African South African Anglican leader called for different interests "whether rich or poor," from all the color spectrums, "Communist, Muslim, Hindu or Jew" to form "a powerful, united coalition which puts first the interests of the poor and thereby the interests of all of us." He was preaching a midnight Easter Vigil at St. George's Cathedral, Cape Town, on Easter Sunday, the venue where Nobel Peace Prize laureate, Archbishop Emeritus Desmond Tutu preached during the struggle against apartheid in the last century. "Like many, I feel that the dream of South Africa sometimes feels more like a nightmare, a prolonged Passiontide, so to speak. "Personal interests, corruption, private gain, entitlement, a vicious contempt for the poor and the common good, a culture of blatant lies and cronyism—and possibly worse - dominate our public landscape," he said. The archbishop noted that is the past week the nightmare worsened after the full impact of President Jacob Zuma's recent actions to change his cabinet, whereby he fired a finance minister trying to reign in his excesses led to the credit downgrade for South Africa. "They have devastated our hopes for the kind of foreign investment which we desperately need to grow our economy and create new jobs. "The impact of the president's actions on consumer confidence and trust is immeasurable. Tens of thousands of jobs are directly affected by just a 10 percent drop in consumer confidence. "If we cannot turn the situation around, we face the prospect of employees being fired; shops shuttering; malls closing; the poor unable to afford bread, paraffin, electricity and the cost of burials; possible hyperinflation - it's as if we are entering the Zimbabwe moment." This is a reference to South Africa's northern neighbor Zimbabwe. Under 37 years of iron-fisted rule and the corrupt land reform of its 93-year president, Robert Mugabe, Zimbabwe has turned from an African breadbasket to a state where millions have fled to feed themselves or to avoid political persecution. Makgoba said, "Some among our leaders have become slaves to a new form of colonial oppression. "It is a moral and economic oppression that manifests itself in the form of one family's capture of our country, and a president whose integrity, soul and heart have been compromised." But, he said, "At the heart of the message of the Resurrection of Jesus is the stubborn insistence that nothing is irrevocable. No betrayal is final. There is no loss that cannot be redeemed. It is never too late to start again." "The promise of Easter can be likened to what I call the new struggle in South Africa. "In that struggle, the realization of the promise of Easter is measured not only by how soon we replace the current administration, but by how well we ready ourselves for what comes next. "How do we prepare ourselves for the future after the end of a deeply corrupt regime? After President Zuma has fallen, will those who benefit from his patronage fall too? "Because if we change leaders but the patronage system that the current leadership has produced doesn't change; if state-owned enterprises, the prosecution and law-enforcement agencies remain captured by corrupt interests, we are no better off," warned the archbishop.